http://www.dailymail.co.uk/femail/article-5048863/How-drop-dress-size-Christmas.html , their title not mine! 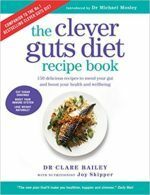 Hi, I have just bought the Clever Guts Diet recipe book, and was very interested in the ferments section. I have already made kefir, which works very well to control my IBS type symptoms. I have just started to make kombucha, and am trying to make other ferments. Today I tried the preserved lemons recipe from your book, but ran into a problem. You list live apple cider vinegar and coriander seeds in the recipe, but there is no mention of them in the recipe instructions. I took a guess and added both to the jar when filled with lemons, and gave a good stir before closing the kilner jar. Was that OK?